PanPastels are mixable, erasable, lightfase and have low dust. This set is an ideal companion to the full 80-color set, or for those looking for extra shine and shimmer to their work. 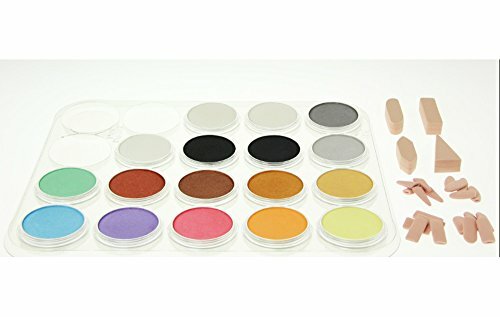 The set includes one of each PanPastel Pearl Colors - Yellow, Orange, Red, Violet, Blue & Green, one of each Metallic Colors - Silver, Pewter, Bronze, Copper, Light Gold & Rich Gold, one of each Pearl Medium - White Fine, White Coarse, Black Fine & Black Coarse, and a Colorless Blender. A Palette Tray with Lid plus a variety of Sofft Tools are also inside. Made in the USA. If you have any questions about this product by Colorfin, contact us by completing and submitting the form below. If you are looking for a specif part number, please include it with your message.